Christmas is only a little more than 3 months away. I know – scary, isn’t it? Pretty soon it will be Halloween, and then *BAM*, it’ll be Christmas in every store. It gets a bit overwhelming. Since every dollar counts in this economy, each year I try to be sure to get a few select toys that my kids really want. Last year, around November, I found myself desperately seeking Zhu Zhu Pets, with none to be found. After searching every store in town, one night I went on eBay, and around 1 a.m., found myself bidding $160 for 4 pets. $160! For 4 small, furry toys, that I knew would make my kid smile on Christmas morning. And then, I panicked. What in heaven was I doing bidding that much for some cheap, little toys that retailed for only $9 each? Was I insane? Amazingly, during the middle of my panic attack, I was outbid (by some other sleep-deprived crazed parent, no doubt). In the end, no Zhu Zhu pets came for Christmas. 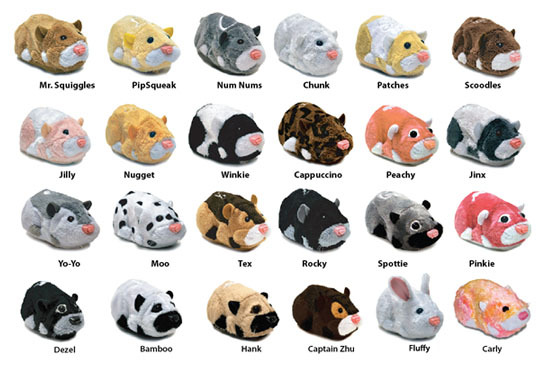 I just did a review of Furry Frenzies Cruisin’ Carrier, and I’m trying to guess ahead of time, which will be more popular this Christmas – Furry Frenzies or Zhu Zhu Pets? Best selling Furry Frenzies include: City Center Play Set, Buster Bow Wow (dog), Senorita Scamps (cat), Whirl Around Playground, and Flurry in a Hurry (rabbit). Pets are typically between $7.99 and $11.99. Best selling Zhu Zhu Pets include: Jilly, Mr. Squiggles, Funhouse, Kung Zhu Special Forces Hamster set of 4, Nugget, Adventure Ball, Add On hamster wheel, Hamster House Starter Set, Pipsqueak, Wild Bunch set of 4, Sweetie, Scoodles, Kung Zhu Battle Arena, Add On ramp and slide, Carrier and blanket, Funhouse set with hamster, Blanket and bed, Convertible sports car, Rocky, Fluffy, Tex, Carly, Moo, and Justice. Pets are typically between $8.99 and $11.99, but can be as high as $20 or more depending on popularity and scarcity. 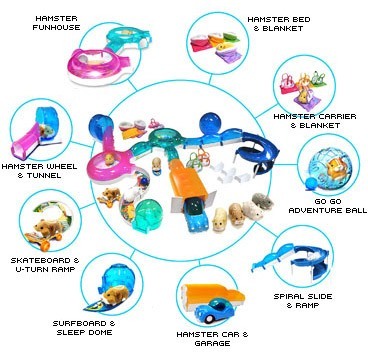 Although there doesn’t appear to be any of last year’s Zhu Zhu Pet craziness yet, on eBay several items – the Giant Hamster City Playset, a Kung Zhu Battle Arena lot (along with Ninja and Warrior hamsters and armor), an Airport, Pizza Parlor, and Beauty Salon set lot, and a set of the girlie pets (Jilly, Pinkie, Sweetie, Roxie, Carly, and Peaches) are in high demand and going for $100-$180. In summary, Furry Frenzies are a relatively new toy, and at this point, they are not even close to Zhu Zhu Pets in sales or popularity. There is only a very limited selection currently available – 3 playsets, 6 pets – and they are barely offered anywhere; Target online only has the Cruisin’ Carrier and City Center, although in-store they also have the individual pets. 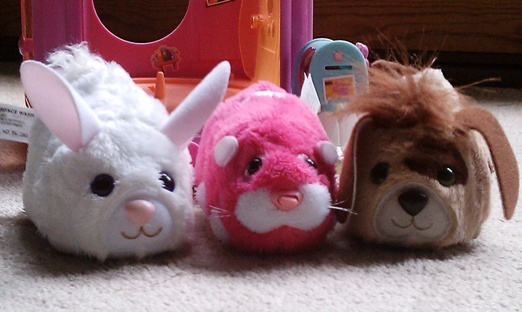 Even though Furry Frenzies are well designed, and *my daughter prefers them over her Zhu Zhu pets, I imagine they will not sell as well as Zhu Zhu Pets, but will probably continue to be in short supply anyway this holiday season. For Christmas, I’m planning to get my daughter the Furry Frenzies City Center Play Set, and will NOT be waiting until November to order it this year. What about you? We only have a small number of Zhu Zhu Pets – I’m interested to hear from people that have the whole hamster habitat-city-metroplis set up. What do you like best? Do you feel it was worth the money you spent on it?